Home Albanian Blogger Let’s go for creative parking in Tirana! 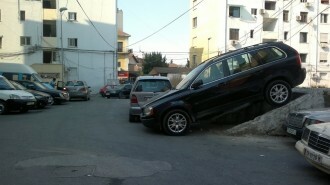 Let’s go for creative parking in Tirana! For several years now, Tirana is facing a worsening situation from the increased number of cars roaming on its streets. To add to the problem there are over 100,000 new cars that enter and exit the city every day from the towns and cities all over Albania. To make matters worse these many cars have to park somewhere so one-way streets are often lined up with parked cars on both sides narrowing the way for all the other moving ones. Also, there is a growing number of cars that park on pedestrian walkways (trotuare) and pedestrian crossings blocking the way for the people who in turn have to deviate and actually walk on the streets with all the other cars so as to get to where they are going. For most drivers the only option to park is near their apartment building and streets where car parking has taken precedence over open areas for inhabitants and playgrounds. In my case, I am both a pedestrian and a driver and as such am very familiar with these issues on both sides, but in this chaotic situation I also have to recognize the creative ways that some drives are able to park their cars even where there is no such parking! This picture was taken this morning while walking through my childhood neighborhood in area that was then totally open and available for children to play and enjoy. Today, it is full of parked cars and no children!